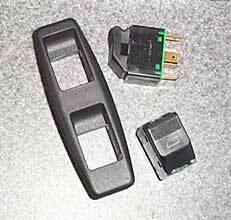 We have chosen to install the Electric Life 4990-10-420 inline, flush mount switch kit, with push-pull style switches. This is a very good looking switch kit, but it requires a very deep armrest in order to mount it. 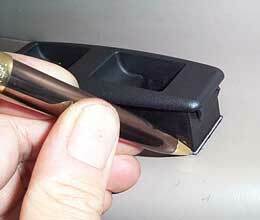 The trim for the drivers switches is traced onto the armrest with a pen. The hole is then cut out with a Dremmel tool. A drill bit and hacksaw blade can also be used, but it's a bit more work. 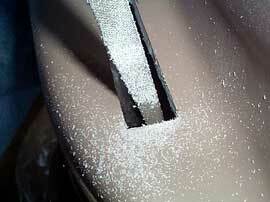 Once the rough hole is cut, a file is used to clean up the edges. 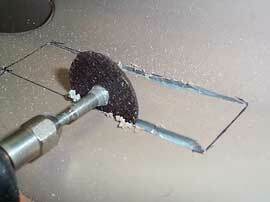 When cutting holes for switches, don't get carried away and make the holes too big. It's a lot easier to have the hole a little too small and file it out to the proper size.